+$A nicely designed and engineered sit-stand desk topper. +$The Ergotron Workfit sit-stand desk topper solves the problems of inactivity and posture with one very well-designed and engineered product. 该+$Ergotron Workfit-TL+$is a desk topper (you place it on top of your existing workspace), and can be switched between sitting and standing options. 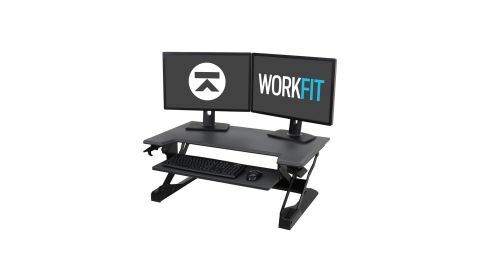 The WorkFit-TL is the largest in the range and will support a couple of monitors, along with a selection of peripherals (a keyboard and mouse, or tablet, external drives and so on). There's also a smaller+$Workfit-T+$, If You Prefer. +$You can switch between standing and sitting by simply lifting a paddle on each side of the desk and raising or lowering it. The process is smooth and very well balanced, even when the desk is fully loaded. The height varies from its lowest position (just an inch or so above your existing desk), and up to an extra 15 inches above – providing a good level for even the tallest users to work at comfortably. +$Ergotron has also added some thoughtful touches to help you get up and running. These include zip ties and cable management piping, so you don’t end up unplugging a vital peripheral when you adjust the height of your desk. +$The finish is a charcoal grey with a slight texture that prevents slippage and reduces eye strain (although a white option is available should that fit your environment better). +$If you work in visual effects, animation or a multitude of other creative industries, it’s likely that you spend the majority of your time sitting at a desk, in front of a screen or two. Even though the evidence is there showing the detrimental effects this can have on your health and well-being, it is taking time for society to catch up and change our default working practices. That shouldn’t stop you from taking measures yourself, and a sit-stand desk is a great place to start. +$The benefits of this desk conversion are clear: you get better blood flow, reduced tiredness levels and your posture will probably improve. They also purport to help you stay energised and be more efficient.